English: Flag of the State of Nevada. The flag is described in Nevada Revised Statutes Chapter 235, Sec. 20 as follows: The body of the flag must be of solid cobalt blue. On the field in the upper left quarter thereof must be two sprays of Sagebrush with the stems crossed at the bottom to form a half wreath. Within the sprays must be a five-pointed silver star with one point up. 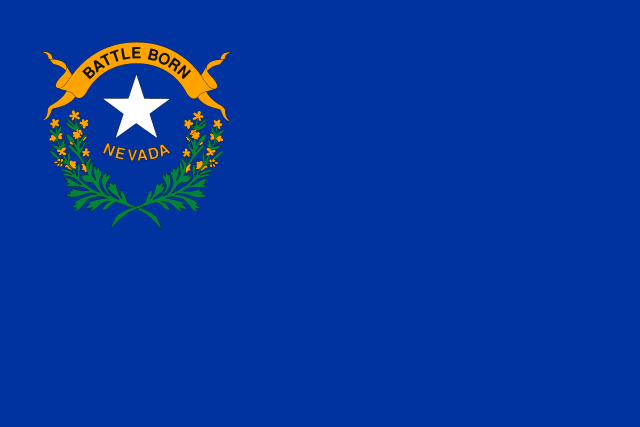 The word “Nevada” must also be inscribed below the star and above the sprays, in a semicircular pattern with the letters spaced apart in equal increments, in the same style of letters as the words “Battle Born.” Above the wreath, and touching the tips thereof, must be a scroll bearing the words “Battle Born.” The scroll and the word “Nevada” must be golden-yellow. The lettering on the scroll must be black-colored sans serif gothic capital letters. Tzintiliztli Original vector image from OpenClipart: usa_nevada.svg. Este archivo se basa en una obra en dominio público. Ha sido mejorado y/o modificado digitalmente. Esta obra derivada ha sido (o está siendo) publicada en el dominio público por su autor, [[:c::User:Wine Guy|Wine Guy]]. Esto es aplicable a nivel mundial. [[:c::User:Wine Guy|Wine Guy]] garantiza a todos el derecho de usar este trabajo para cualquier propósito, sin ninguna condición al menos que éstas sean requeridas por la ley. 10:15 14 Yēt 2010 750 × 500 (42 KB) Wine Guy Corrected colors according to Nevada statutory description; various tweaks of canton. Ahmo cateh zāzaniltin tlein tzonhuiliah inīn tlahcuilōlhuīc.